This book was the first of a list of required reading for a Lay Worship Leader course that I will be taking over the next two years. I should also start by saying that the first weekend of the course was this past weekend, so I've already had a chance to discuss this book with the other course participants. 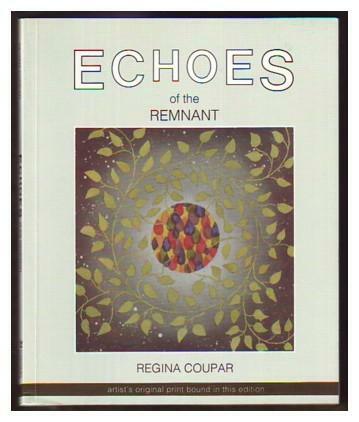 "Echoes of the Remnant is a collection of visual images, poetry and prose which convey the author's unique perspective on spirituality. ... The author asserts that people are responsible for shaping their own worldview by the manner in which they set priorities. As spirituality is awakened and developed, many people find their perceptions and expectations altered. 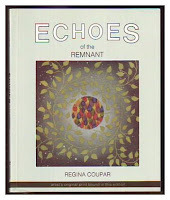 Echoes of the Remnant presents new metaphors which are helpful for discussing spirituality in the language of our time." I came to this book wanting to like it. The format intrigued me - a collection of pictures, poetry and prose. But somehow it didn't quite work for me. First of all, I didn't "get" the pictures. I will be the first to admit that I don't know anything about visual arts so I would be open to someone explaining the pictures to me; but they didn't say anything to me. Secondly, I found the prose to be very ramble-y. There were nuggets of beauty in there, but I had to work too hard to find them. Plus, she committed the cardinal sin of writing, by trying to explain a concept using the same words as the concept. My thoughts as I was reading it was that it would have benefited from a better editor. Interestingly enough, I discovered while trying to find a cover image to use in this post that this book was published "under her own imprint, Gamaliel Publications." I have found that self-published books tend not to have the same quality as those published by a publisher proper - fortunately there were no glaring typos (though I am the world's worst proof-reader); but that may explain my impression that a better editing job was needed. What kept me going through this book were the poems. That and the fact that it was required reading! The language of the poems was so clear and precise that I couldn't believe that they were written by the same person who wrote the prose sections. I flagged several of my favourites throughout the book, and I think that including one of them here would be the best way to end off this post. I've already ordered the books for the next weekend in March, and I'm hoping for better things next time around.